All Seasons Specialty Doors is a thriving division of East Coast Garage Doors & Gates specialising in custom design and installation of luxury Garage Doors, Smartech Tilt and Folding Door Systems, Gates and Fence Infill Panels to add style, security & value to properties. 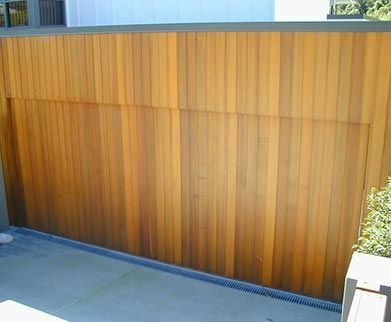 Our range of unique, luxury and custom designs including Counterbalanced Smartech Door & Wall Systems, Garage Doors and Gates incorporate any combination of composite materials including Aluminium, Glass, Perspex, Vitrabond or various Timbers such as the very popular Western Red Cedar. We have trusted and experienced resellers of our specialty product up down the East Coast of Australia including Cairns, Airlie Beach, Mackay, Bundaberg, Yamba, Coffs Harbour, The Entrance, Sydney and Nowra. Our Style and Quality combine to deliver the “Wow Factor” you will love! We custom design garage doors and gates to suit your property’s style, from contemporary to classic. We create stunning entrances to complement architectural bespoke homes, traditional Queenslanders, relaxed luxury beach houses, inner city townhouses, rural retreats and more. Modern access systems enable us to set you apart from the rest, whilst providing added privacy and security that brings peace of mind. Our exquisite timber range of doors, gates and fence infill panels are custom designed and crafted in beautiful Western Red Cedar and other quality wood finishes. We also design, manufacture and install entry solutions for residential complex car parks and other commercial applications with made to measure bar grilles, louvered panels and Amplimesh doors or gate entrances. 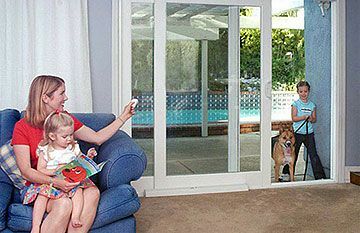 Smartech door, wall and window systems fold or tilt into a vertical position to bring the outdoors in! Perfect for commercial and residential properties wanting to maximise your space and ‘wow’ factor. 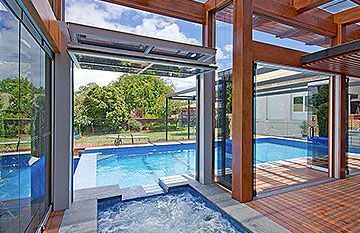 Unlike sliding or bi-fold glass doors, when you open our vertical lift system you create an unobstructed view and have total use of your merged indoor and outdoor areas. Read more about our range of Smartech counterbalanced folding and tilt systems. 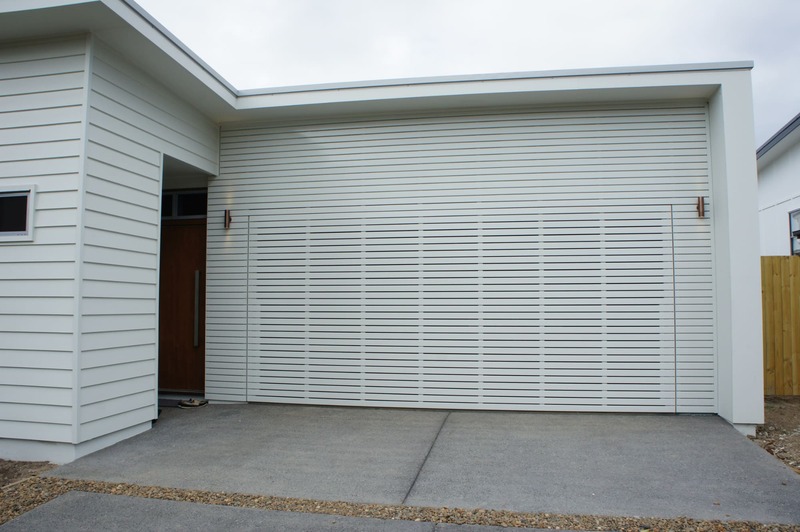 featuring All Season Specialty Door products including timber or aluminium slats create a seamless and modern look that is becoming one of our most popular custom designs. 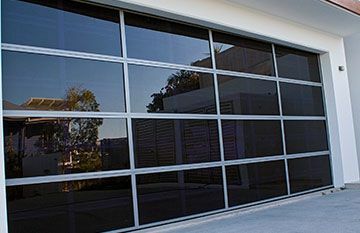 Read more about Tilt Garage Doors. Looks incredibly sleek and modern, made with an aluminium composite panel. We ensure that the aluminium frame of these doors are powder coated to complement the Vitrabond panel colour. Can be used in commercial or residential applications and provide the security and functionality of a solid garage door, but allow some airflow through into the garage area. It is made up of fixed powder coated louvers placed inside a powder-coated aluminium framework. Custom made as either a sectional panel door or as a tilt door. give a stylish slatted appearance and allow both visibility through the door and plenty of ventilation as the air flows freely. 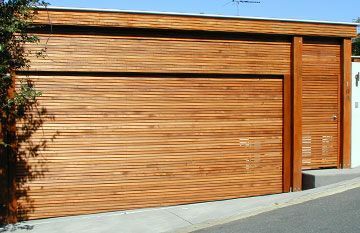 These doors can be manufactured with Colorbond boxed channel or western red cedar slats spaced over each panel of a sectional door or tilt door design. We make pedestrian gates, fascia panels and fence infill panels to match! Our highly experienced team will work with you to design, create and install a unique, structurally sound and functional garage door or gate that will transform your entrance and exceed your expectations! Contact Us today or visit our friendly and professional team at our Display Showroom on the Sunshine Coast, open 8am and 5pm weekdays. We would be delighted to meet you onsite to discuss your concept and provide you with an obligation free proposal of the best options. Very professional and friendly tradesman. He was polite, courteous and he even cleaned the dirty finger marks off the door for me. - Kerry, Mooloolaba. Just had to phone to say what a wonderful job your Technician did; I am an employer myself and your guy is a great worker. - John. Wootha. Wow factor! Thank you so much for our new custom made cedar garage door. The front of the house looks incredible! - John & Mary, Sunshine Beach. We would like to express our appreciation for the exceptional service, help and advice we received...We engaged East Coast Garage Doors to re-install the door. Dealing with tradesman and management was a dream. They were extremely professional, we could not have asked for better service... We'd be happy to speak to future clients for a well-deserved recommendation. We cannot thank you enough. - D & B Lovelock, Broadbeach. Thank you for the superior service we received during design and installation of our new garage doors. All of your staff ...have been professional, friendly, knowledgeable and efficient. The doors look fantastic and have made a huge difference to the look and value of our home... highly recommended. - Dr Barbara Haddon. Thank you for the great job installing our new Smoothline Door and motor. It looks fabulous! - Johnathon T, Fig Tree Pocket.